Sunday has been the perfect day so far. I woke up early, watched Sunday Morning, and went back to bed. When I rolled out of bed again I did some cleaning, which is very calming for me, and some Internet browsing. I came upon this article: J.Crew helps preppy go Euro by Virginia Heffernan for the New York Times. J.Crew has been in the news a great deal lately, as everyone is extremely impressed by the creative direction of Jenna Lyons. This particular article touched on how J.Crew made preppy accessible. It made me think about how any trend, any “look” is made accessible and affordable by stores like Forever 21 and H&M. I know I enjoy being able to satisfy my fix for fashion quickly instead of having to save my money for a bigger more long lasting purchase. Immediate gratification is always better of course. I have a constant internal debate about whether I should just invest in the better quality product. However, I see a great benefit in putting everyone on a similar playing field as far as access to fashion. I love to see all of the style blogs that feature a mixture of high-end and low-end pieces as well as thrifted and vintage clothing. Previous Post Best game day look winner! 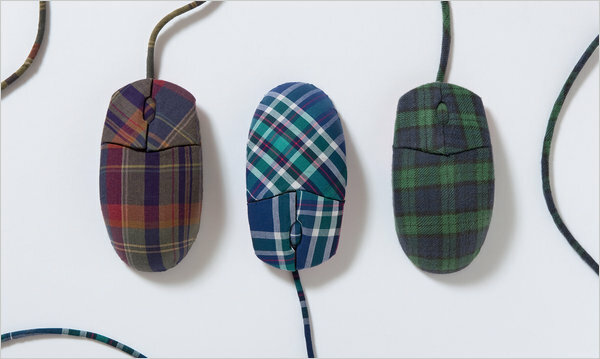 Possibly off topic, but I love the plaid computer mice!